How to work the MP3 Player? I know it is most likely posted, but we just picked up the new to me 2012 Reeper. My wife would like to know how to make the mp3 player work? I can not find where to plug in the USB stick? Yep, it is right there in the glove box. Now please tell me how to work the thing? I have pushed all the buttons, nothing lights up, and no sound. What am I doing wrong. That I can't help you with as I never used mine and it was removed within a week of ownership. Scott, what did you replace it with? Wife wants an XM radio? HUMMMMMMMM? I put in a marine radio. Several people have put better versions of an MP3 player. That is probably the better way to go. I fitted a Pyle marine Amp, great for connecting the phone to. The first time you click on the red button it turns it on and it's set to MP3. The second time you click the red button is FM. On one of mine it turned on, but no sound came out. Ended up being a bad unit.... So hopefully it was just user error versus something wrong. Like many others have done though, I recommend replacing the unit as not being able to see the station or track is annoying (at least it was to me). Someone did a bluetooth add on and use a cell phone to run the play list, try the search feature. If I could hear I think I would try that. ryan9902, did unit install without major issues? That looks like a good idea Ryan! I put a bluetooth adapter in and just use my phone but the stock system would benefit from an update for sure! From ryan9902 idea, and buying a mbquart gmr1 radio that I installed,I removed the cylinder speaker from the reeper, drilled out the the end of the cylinder that was closed off, went wally world and bout two four inch speakers ($25.00)they were the only four inch speakers they had, mounted one on each end. I hooked them to the radio, and wow what a really good sound. Looks like I am going to have to modify my bass tube now lol. Glad it worked out good for you. In addition to this user instructions you can also in radio mode press the play button for 2 seconds. The radio should scan for stations. When finished scanning change stations with the next/previous track button. This is how I fixed mine like others. It was my first mod. It has a wired Mike that I put on the stearing column and without a top on I could talk to my wife over the blue teeth. I haven't got around to using all it can do. As I am a a amuture at a lot and a professional at none. Mine would not come on either. 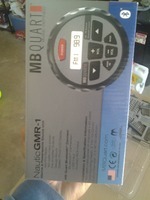 It has since been replaced with a Pyle marine grade from Amazon. Wired like Ryan right from the fuse box!! The little tube under the dash I replaced the speaker. Mine was a 5 1/4. If your USB stick is plugged in, press and hold the red "on: button for about 3 seconds. It will start to flash and you will have sound. If not try increasing the volume using the up/down volume buttons. Change songs by hitting the next or previous track buttons. Took me a while to figure it out too. But it works pretty well. I just purchased a 2015 Discovery 1000 and would like to change out the radio ,can anyone please help me with info or pics on how to take the dash apart. All replies appreciated. 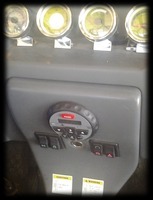 The vertical console you need to remove is held to the main dash by wing nuts accessible by reaching up under the dash. There are four of them and kind of in a corner pattern. This section can then be removed. 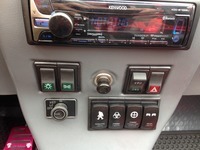 If installing a new radio of single din design the main dash will also need to be cut to fit the radio. I can try and provide pictures later today or tomorrow.